I recently took a trip to Montana, and I don’t know if it’s just that I have never noticed this before or that I have just not been to the right places, but right up front at a cute little rustic pizzeria in downtown Missoula there was a well-placed sign that said “Braille menus available”. Now, before I get too far into this, I should tell you that Montana changed me. It was beautiful, natural, peaceful, rural yet cultural, friendly, family-oriented, and laid-back (I’ll stop there for lack of space). For whatever reason, whether I just needed a break or Missoula is literally the most wonderful place on earth (do you know there is practically no crime there?! ), it has become my new mantra when I start to feel the pressures of life weighing down on me. Coming from Chicago you can imagine my shock when I didn’t hear one honking horn while I was there nor did I see many people on their cell phones. And maybe people had to wait five minutes for their non-fat latte, but no one seemed to care! It reminded me that there really isn’t much need for most of the rushing and hurrying and worrying that takes place in my everyday life. So anyway, maybe it was this refreshed view of life that allowed me to see some major significance in this sign about Braille menus at the restaurant, but whatever it was, my wheels were spinning. Why can’t Braille menus be available everywhere? Wait, are they available everywhere and I’m just clueless (be nice when you answer that one)? How often does someone walk into a place of business and there are already alternate formats of menus, price listings or other materials readily available to them? And how obvious is it usually that these are available, or do you have to ask someone, who then has to ask someone, who then has to ask someone who thinks there are some in the basement? I’m curious. 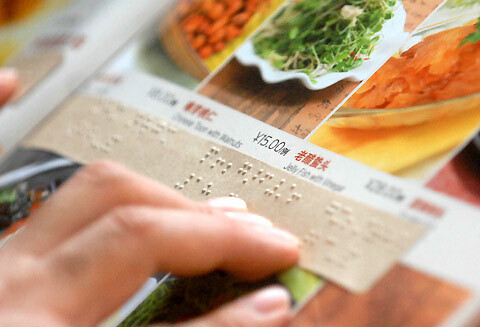 Post Script: My curiosity led me to do some web searching before releasing this blog and I did find some YouTube videos of well-known chain restaurants that have Braille menus available, at least at specific locations. Check these videos out, and put the word out if your restaurant has accessible menus!